There’s no shortage of trade shows and conferences in the digital signage industry– not to mention the broader AV/pro video industries. So why would the recent ISA International Sign Expo held the end of April in Orlando, warrant more than usual interest? And what does it have to do with digital signage? A good many digital signage folks and companies well knows in the industry made the trek to ISA and as the dust as settled it’s a good time to put this growing phenomenon in perspective. First the basics: The ISA Sign Expo is the premier sign show for the traditional sign industry and that it is the annual confluence of all the big sign equipment manufacturers and suppliers of signage products and their target audience being the sign shops they serve. Their numbers speak for themselves in continuing growth in double digits. This year attendance topped 18,110, up more than 10 percent over the last time the show was held in Orlando. Total exhibit hall space, at 198,900 square feet, and was also a record-breaker for Orlando. In all, more than 580 companies were represented on the expo floor, with a significant number using the show to introduce new product lines. The industry they serve is made up of over 35,000 sign shops around the country of every conceivable size from mom and pop operations all the way to giant sign “factories”. In short, ISA serves a wide spread and robust constituency to say the least. Ingram Micro, Almo, and a host of other industry vendors. 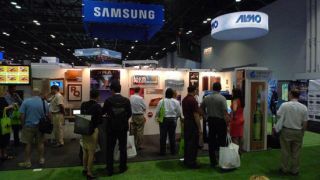 What rounds out the vision and mission of the show and what makes it special for those of us in digital signage is the growing acceptance and adoption by the ISA Sign Expo, their exhibitors and sign shops of what they refer to as “dynamic digital signage”. They have come to realizes that this is a growing part of the overall signage industry and is an additional revenue stream for manufacturers, distributors, and sign shops alike. They are coming to understand that it is not an either/or situation but a combination of static and dynamic that is in the process of becoming mainstream sooner than later. Sign shops have the customer relationships and content expertise built and nurtured over many years and they are increasingly expanding their business to embrace these new opportunities. Proof of this burgeoning market resides in the participation in the special events surround the ISA Sign Expo and dedicated to dynamic digital signage. The day before the exhibits opened there was a full day of educational seminars sponsored by ISA with guest experts in the field to educate sign shops on a variety of topics aimed at facilitating their new and expanded business opportunities. On the show floor for the second year in a row there was the Dynamic Digital Park and it included 12 new exhibitors and was 34 percent larger than in 2013.There is an old saying that we are known by the company we keep and so it is with trade shows. Participants in the Dynamic Digital Park included names like Samsung and 3M, along with CMS providers like BroadSign and MVix, and distributors from the IT and Pro AV spaces like Ingram Micro and Almo. Of special mention are names familiar to the traditional signage world who are entering into the dynamic digital signage market in a big way. Roland released its DisplayStudio™ at Sign Expo and Glantz Dynamic Solutions a new division of N. Glantz was one of the larger sections of the Dynamic Digital Park. Of course the digital signage industry was well represented again this year by the Digital Signage Federation who helped sponsor the educational activities and to show support for the efforts of ISA in furthering the growth in this fast moving area. We cannot say it any better than Lori Anderson, ISA President and CEO as she characterized the event, “There is no doubt that ISA International Sign Expo 2014 was an unqualified success”, said Anderson. “There were opportunities at every turn for sign companies to expand their businesses and to refine and improve their existing lines. The key words here are “opportunities” and the “expanding of sign business” i.e. into digital signage. As I said in the title, the ISA Sign Expo is not just another tradeshow. Alan Brawn (alan@BawnConsulting.com) is a principal of Brawn Consulting LLC an audio visual and IT consulting, educational development, and market intelligence firm with national exposure to major manufacturers, distributors, and integrators in the industry. He was formerly President of Telanetix and previously National Business Development and Product Marketing Director, Samsung Electronics. Brawn is a member of the Imaging Science Foundation and Managing Director of ISF Commercial. Alan is CTS certified and an adjunct faculty member of InfoComm, and chairs its ISO/ANSI Projected Images Task Group. He is a member of the International Commission on Display Metrology for SID and a Learning Unit provider for NSCA and instructor at CEDIA. Most recently he became Director of the Digital Signage Experts Group certifying professionals in the digital signage industry.